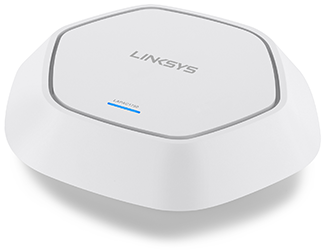 The Linksys LAPAC1750C is a Business Dual-Band Cloud Access Point built with Linksys Cloud Manager. It allows you to remotely manage multiple access points, sites, and businesses under one login and easy-to-use dashboard. It has a network map feature to let you see the current status of all your networks, including how many devices and clients are in use at each location. You can also view statistics and details on your networks or on each access point, and how much bandwidth is being used. Other features of the Linksys LAPAC1750C are supported when managing the access point locally only. To learn more, click here. Green Blinking System is starting. Solid System is normal. No wireless device connected. Blue Blinking Software upgrade in process. Solid System is normal. At least one wireless device is connected. Red Solid Startup process or update failed. Hard reset or service required. Power - Connect the AC power adapter to this port. The power adapter uses 12 V. You can only use the adapter that came with the access point. Ethernet port - Connect a network device to this port. This port supports Power over Ethernet (PoE) with a PoE switch or PoE injector. Linksys LAPAC1750C is powered on from an 802.3af and 802.3at (PoE+) compliant source. NOTE: When both PoE and AC power adapter are connected to the access point, the device will get power from PoE. Using Cat5e cable or a better cable is highly recommended. Reset button - Press and hold this button for about 15 seconds to powercycle the device. Press and hold for longer than 15 seconds to reset the device to its factory default settings. NOTE: There are no operating system limitations. 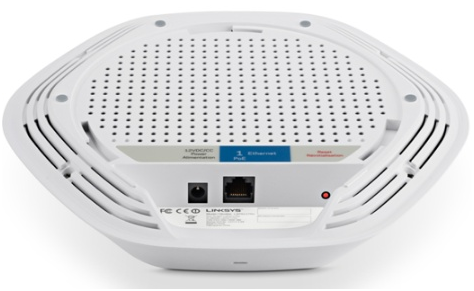 To learn more about the Linksys LAPAC1750C, click here.